Over the years, the suggestion has been made several times that the Voynich MS is not a genuine old manuscript, but a fake that was created by Wilfrid Voynich himself. Voynich is the man who did it (or had it done for him). There is a long list of observations demonstrating that the MS is genuinely old, from inspection by qualified experts and forensic investigations. Parts of the age and history of the MS can be reconstructed just from visual inspection of the materials. The provenance of the MS can be reconstructed convincingly and consistently from many independent sources, through the Jesuits in Rome and several earlier owners in Prague, all the way back to before 1622. Around 1900 there was a thriving business in forging historical artefacts, but these forgers were professionals who were considering risk and cost. A long MS on old parchment would be high-cost, high-risk and there are only very few examples of forged MSs on parchment, typically with either very few or very small folios, and/or on reused parchment. Voynich had just acquired the most valuable set of books in his entire career, and was about to make a fortune from them. At this point in time he clearly had no motive to spend effort and time to create an additional fake MS. Furthermore, no credible scenario for him doing this can be presented. From all correspondence left by Voynich it is clear that he was baffled by the MS and its history. By far the most critical point in the above list is nr. 1. The same experts who exposed one of the rare fake MSs on parchment through very detailed forensic analysis (1), repeated the same analysis on the Voynich MS, and did not find anything suspicious about it. That would only leave the possibility that the Voynich MS is a fake of wholly unprecedented quality, perpetrated in 1912 but capable of fooling 21st century knowledge and technology. However: the supposed faker presented it as a 13th/14th C Roger Bacon MS, yet it bears no sign at all of a Roger Bacon origin. In fact, he was struggling to convince people that it was a Roger Bacon MS at all, and in the end lost that battle. It is simply not credible that the most accomplished of all fakes doesn't actually show any evidence of what it is supposed to be a fake of. This is the most essential section, demonstrating that the MS is not a modern fake but a genuine old MS. I would like to reiterate that the Voynich manuscript is certainly a perfectly authentic document. The sewing/stitching of the binding is centuries old. On photographs (e.g. IMG: here) it is partly hidden by Kraus' restorations of 50 years ago, but it was studied in detail by several expert MS conservators on 7 November 2014. When Kraus acquired the MS, the cover was almost entirely detached. However, the imprints on the dorso made by the old binding (i.e. without Kraus' repairs) show that it must have been attached tightly for a longer time. There are wormholes on the very few first and last folios. They don't extend into the MS because these insects did not feed on parchment. The holes cut through writing and drawing elements, showing that they appeared after the MS was written. There are stains on f1r and f116v from an earlier cover. Combining this information with that related to the wormholes, the experts conclude that the MS must have had an earlier cover of wooden boards covered by tanned leather. The MS does not include yellow flowers, unlike essentially all other illustrated herbals. Upon closer inspection, it appears that there are remnants of a faded yellow pigment, which must have been an organic yellow that has faded through the ages (7). In 2009 radio-carbon dating of the parchment and forensic testing of the paints and inks was performed. The parchment dates from the early decades of the 15th Century (8). All tests of the inks and paints, both in 2009 and 2015, failed to bring to light any trace of elements inconsistent with this date. This is a test where fakes perpetrated more than a century ago are almost inevitable to fall through. This section does not by itself prove that the MS is genuine, but it strongly reinforces the conclusion from the previous section with documentary evidence. Throughout most of the 20th Century the MS existed in a kind of vacuum. The only known reference to it was the letter from Marci found together with it, and at the same time Voynich was secretive about his 'discovery'. The pair of documents could both be a fake, and this, among other things, led to the publication of Barlow (1986) (9), suggesting that it was a fake by Voynich. When, around the year 2000, several references to the Voynich MS dating from the 17th Century were found in the correspondence of Kircher (10), the main reason for the above suspicion about the Voynich MS was removed. Further suspicion about Voynich as a possible faker arose because of his legendary capability of finding previously unknown books (primarily incunables and early prints). It has been suggesteed that these could be fakes. This aspect is addressed (without the suspicions) in Whitemann (2006) (11), and here we see that many unique or previously unknown books offered for sale by Voynich were soon found in several other copies, showing that this particular suspicion was equally not founded (12). Voynich's secrecy related to his acquisition of the MS could be a further source for suspicion, but now we know that he acquired several MSs at the same time, many of which are now preserved in American libraries. All of these are genuine old MSs which originate from the Jesuit Collegium Romanum. His secrecy applied equally to these genuine MSs, and it was because of a promise made when he acquired these MSs. It clearly has nothing to do with a supposed fake. Most of the collection from which he acquired these MSs is now in the Vatican library (13). We can see that the cover of the Voynich MS is similar to other MSs that he acquired at the same time, and also similar to the MSs that went to the Vatican. The similarity of all these covers was the result of a general rebinding by the Jesuits reported in Ruysschaert (1959) (14). The historical archives of the Pontifical Gregorian University have even published a text written shortly before this rebinding (15) indicating that such a rebinding was needed because the collection was infected by woodworms. We see that the evidence related to the provenance and the codicology are fully consistent. At least three of the books that were acquired by Voynich on this occasion, and later sold by him, were seen and consulted before 1870 while they were in the Collegium Romanum library (16). Many of these MSs still show their original Collegium Romanum shelfmarks. Some 25 manuscripts (including autographs) of Kircher that are now preserved elsewhere can also be traced back with certainty to the Collegium Romanum library, so it is fully consistent to find the Voynich MS, that was sent by Marci to Kircher in 1665, in the same collection. Two letters letters from Godefrid Aloys Kinner to Kircher, written in 1666 and 1667 respectively and now preserved in the Kircher correspsondence, tell us that Marci had recently sent an unreadable MS to Kircher for translation (see note 10). The unnamed previous owner of the MS that Marci referred to in his letter has now been identified as one Georg Barschius, and one of the letters he reportedly sent to Kircher has also been found. Equally, the response from Kircher to an even earlier (now lost) letter from Barschius has been found in Prague (see note 10). In summary, we have a fully consistent trace of the Voynich MS from the 17th Century till its discovery in 1912 by Voynich. This part is not intended to provide evidence against the Voynich MS being a fake, but to present background information relevant to the other sections. Around the start of the 20th Century there certainly was an active trade in faked old artefacts of all nature. The most famous proponent of this trade is the so-called 'Spanish Forger', who was first identified by Belle Da Costa Greene of the Morgan library, and has been the subject of considerable study (17). He most probably worked in Paris. Many of these forgers were accomplished artists who had considerable knowledge of history, as was needed in order to fool their clientele. They were professionals, primarily interested in making a profit from sales, and were taking into account the risk of detection, and the cost involved in making their forgeries. W. Voelkle (see note 17) clearly states that the Spanish forger deliberately avoided faking long MS codices because of the risk and cost involved. Indeed, there are only very few such fake MSs at all. In general, the vast majority of fake MSs consist of authentic single-leaf MSs, to which a painting was added to make it more valuable, or the fake signature of some famous person (for example William Shakespeare). I am aware of two forgeries of parchment codices from approximately the relevant time frame. The first is the so-called 'Archaic Mark' (see note 1). This MS consists of 44 folios of only 11.5 x 8.5 cm, i.e. 22 bifolios of 17 x 11.5 cm, so one bifolio is even smaller than a normal page of the Voynich MS. The parchment has been scraped to remove any earlier writing and painting on it. The forensic reports clearly indicate the presence of anachronistic elements in the paints, and a suspicious binding. The Spanish forger has forged 11 MS codices, but in almost all cases this means that he added some illuminations to existing MSs. I have found only one complete faked codex (18), though there may be more. This MS consists of 69 parchment leaves of 20.3 x 15 cm, which is approximately the size of the Voynich MS. There is no indication if these were previously unused and they don't appear to have been radio carbon dated. In both cases, the parchment used was most probably recovered from existing old manuscripts, in the second case possibly even original blank folios. By the very nature of the topic, this part is more speculative than Parts 1 and 2. Starting with the means, if the Voynich MS were a modern forgery, then the forger needed a large amount of previously unused parchment from the early 15th C. Since we saw above that the stitching of the MS is very old, one might suggest that the MS was written in a previouly bound volume with empty pages, but this can be excluded for three different reasons. The first is that in several locations drawings and text 'disappear' in the binding, so these pages were written, drawn and even painted before they were bound (19). Secondly, no previously bound book with blank pages would have the occasional foldout folios that the Voynich MS has. Finally, it would also be expected that the pages had been trimmed. 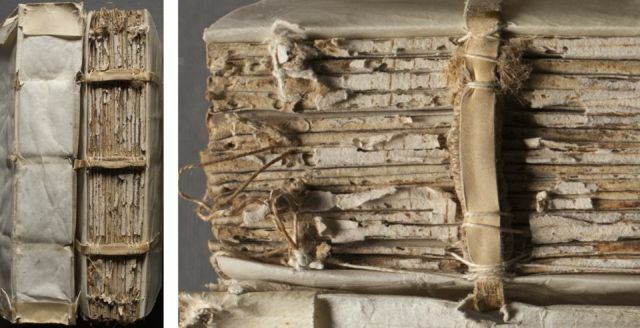 If we were to ignore that the binding is genuinely old, another way to create a Voynich MS fake would be to take leaves from existing old manuscripts. The two examples of known fake manuscripts mentioned in Part 3 were created in this manner, and an old book dealer like Voynich would be in a good position to have occasional access to usused sheets of old parchment, by dismembering old books. For a moderately long MS like the Voynich MS, in such a case one would expect to find a patchwork of parchment from different ages, something that was specifically taken into account during the radio-carbon dating of the Voynich MS (see note 8). In reality, the parchment is of similar quality throughout the MS, and not a patchwork of different types or from different ages. Another possibility is that the MS could have been created from a stack of sheets of previouly unused parchment that had been preserved for 500 years and never used for a book. In both above-mentioned cases, the mixture of normal-sized folios and large foldouts of different sizes, yet from similar parchment that has been dated to a single time frame, makes this scenario unrealistic. This argument is also presented in Zyats et al. (2016) (see note 5). And we do need to keep in mind that the parchment has been bound together centuries ago. Motivation and opportunity are closely linked. The statements of Voynich related to his discovery of the MS can be evaluated against the known evidence (some of it quite recent) (19). He did indeed obtain the opportunity to buy a set of valuable MSs from a larger collection. This collection is fully identified, and consisted of classical and humanist MSs that trace back to the Collegium Romanum (see note 13). He did not discover this collection himself, and it was not in an Austrian castle. It may have been in a castle or villa near Rome. His secrecy was because he had to promise this as a condition to acquire the MSs and he stuck to this promise all his life, with the exception of a mention in confidence to his wife. His descriptions of the previous owners of these MSs are confirmed in complete detail, including the arms of the Duke of Ferrara and Modena (Borso). The Voynich MS appears in the Jesuit list of books for sale, written in 1903, but in a way that does not allow a positive identification. The suspicion could therefore still be that Voynich decided to 'introduce' this fake as an additional MS supposedly from this collection. However, the presence of the MS in this collection is fully consistent with the fact that it previously belonged to Kircher. It would be an unacceptable coincidence that Voynich, unknowingly and accidentally, created a fake MS that matched a really existing one once owned by people in Prague and sent to Kircher, namely one written in unintelligble writing, full of herbs and astronomical drawings. So, could Voynich have seen the letter from Barschius and faked the Voynich MS accordingly? This highly speculative option has a number of severe problems, that basically fall into two different categories: the first is that it is highly unlikely that he could ever have seen the letter, and the second that, even if he had, the resulting fake should have looked very different. This is all very speculative, and there is no need to go into the details, because there is an even greater problem, namely the lack of motive and opportunity. There is no possible scenario for Voynich creating the MS. Did he get the idea before he saw the Collegium Romanum MSs and the Barschius letter (at a time when he could still have had a financial motivation)? This is the unacceptable coincidence mentioned above. Did he get the idea after? Here, he was about to make the most lucrative deal of his entire career, so there was absolutely no motive to spend a large effort and cost, at great risk, on a completely uncertain fake. He sold his first two MSs from the Collegium Romanum collection before July 1912 for an amount that is equivalent with 1.4 Million US Dollars in 2015. And there was no time because the MS was already seen in London by the end of 1912 (21). This section provides no additional proof or evidence. It paints a background picture of Voynich's actions after he acquired the Voynich MS, and a few related points. No clear theory has been formulated about how or why Voynich would have faked the MS. Did he also fake the Marci letter at the same time? Did he also anticipate the full provenance from Bacon to present through John Dee as part of his plan? Following is a summary of Voynich's own activities related to the MS, after he acquired it. It is based primarily on letters preserved in the Beinecke library. In 1911 or 1912 Voynich obtained the various MSs from the Jesuits, according to different sources. These sources can be reconciled if one assumes that Voynich became involved in 1911, and the sale was completed in 1912. Already on 29 July 1912 there is an invoice to Pierpont Morgan for two manuscripts that Voynich acquired from the Jesuits. These had already passed through several hands, and through an unsuccessful sales negotiation with the archbishop of Budapest. In December 1912 the MS is admired by potential buyers in Voynich's London shop at Shaftesbury avenue (see note 21). In November 1914 Voynich makes his first trip to the USA. In his 1921 presentation he states that at this time he had not yet seen the barely visible Tepenec signature on f1r of the MS. In October-November 1915 Voynich has several exhibitions of (a.o.) some of the manuscripts he had obtained from the Jesuits. He sells quite a number of items at these occasions. He spreads the story that he discovered them himself in a castle in Austria, after tracing some correspondence. This story is known not to be true. In 1916 he sold the "Vitae Patrum" MS (also from the same collection) to Morgan for US$ 75,000 (half the original asking price). Voynich's further actions and investigations into the MS and its history are described in some detail here. On 19 July 1930, four months after the death of Voynich, his widow writes a letter, to be opened after her death, about what Voynich told her in confidence: that he acquired the MSs (the Voynich MS being one of them) from the Vatican through the help of the Jesuit Fr. Strickland. This took place in Frascati. He was invited to buy them in or around 1911. He had to promise absolute secrecy about the sale. The reader may judge whether it is reasonable that all of this is just 'show' to cover up his faking of the MS.
To my best knowledge, the 'evidence' that has been offered for the theory that Voynich would have faked this MS consists entirely of speculation, i.e. of even less weight than part 5 above. The Voynich MS is a true enigma. How could a MS from about 600 years ago be unintelligle? Does that mean that it should be a modern fake? There is a certain attactive and spectacular aspect to this notion. The suggestion that it is a modern fake doesn not at all help to explain any aspect of this mystery. For example: Margaret M. Mitchell, Joseph G. Barabe and Abigail B. Quandt: Chicago's "Archaic Mark" (ms 2427) II. Microscopic, Chemical and Codicological Analyses Confirm Modern Production, Novum Testamentum 52 (2010), pp. 101-133. >>See summary. See Zyats et al (2016). For more details see here, in particular note 6. Whitemann (2006), pp.25-26, >>see online here. We cannot be [...] certain [...] that the books in this catalogue are "unique"; our books exist, and where one copy has been preserved to our time it is hardly likely that all others have been destroyed; but we can confidently assert that no other copies are known to exist in any important library, and that they are not even mentioned in any bibliography within our knowledge. We have, of course, not searched works of recognised unreliability such as sale catalogues and booksellers' lists. Ruysschaert (1959). Grafinger (priv.comm.) reports that about 90% of the Vatican collection has this type of cover. These three MSs are identified in this table as J20 (Cicero, De Natura Deorum), J22 (Dydimus, De Spritu Sancto) and J30 (Marcanova, Antiquitates). >>It is described here. Examples of cases where he added illuminations to existing codices may be found >>here (Christie's sale) and >>here (Beinecke MS 283). Some examples are: f33v, f34v, f77v, f78v, f79r, f80r, f81r, f83r, f90v1, f96v. This is done in considerable detail here. As reported in Millicent Sowerby (1967). Possibly, these were triggered by an article on the MS that appeared not long before 18 May 1918 in the "World", which I have not yet found. Voynich used a historical novel by Bolton (1904) as his main source for events at Rudolf's court.